So how did I end up with another foster chicken? (My third in three years, by the way.) My neighbor Amy and her daughter were in their golf cart on the far side of the neighborhood where there is a lot of new construction going on. They saw a chicken in someone’s yard and asked about it. 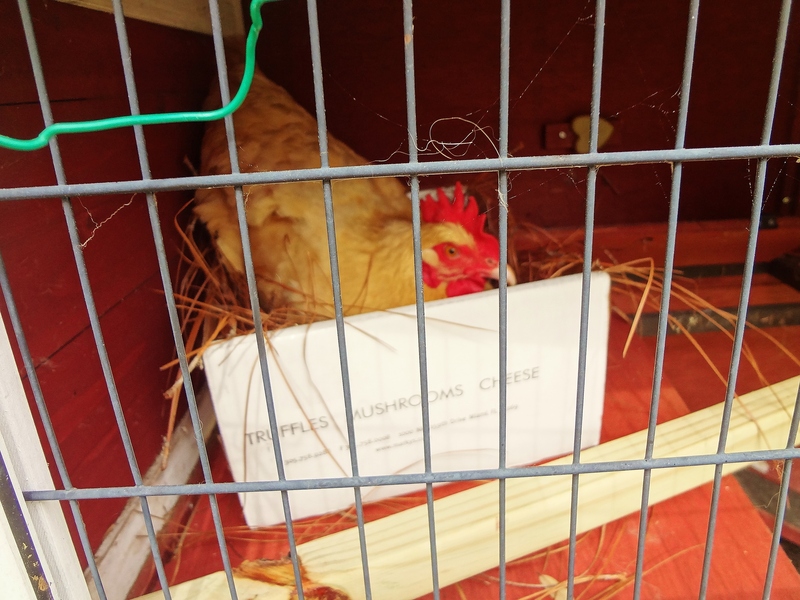 Apparently the chicken had escaped from her farm and was trying to survive in a residential area. Amy got some help from a couple of kind construction workers and she captured the chicken, put her in a pet carrier and brought her to my house. (Where else, right?) So Jim and I got to work modifying Buster’s playhouse into a temporary home for our new friend. Jim made a perch for her and I made a nest from a cardboard box and some straw. 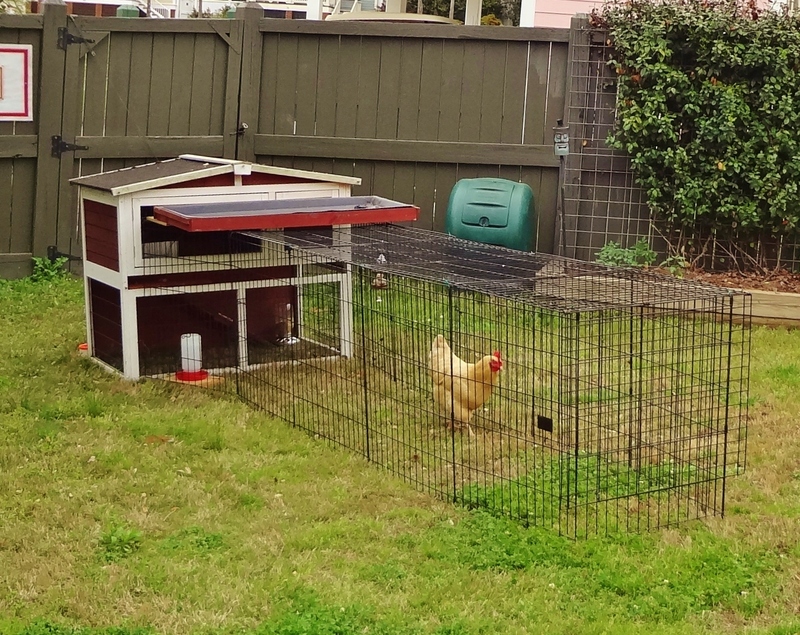 We rigged some pet fencing around the coop so she could have some room to scratch and look for bugs. I made a mad dash to the farmer’s supply store the next morning for some organic pellets and VOILA! We were in the chicken business again! We named her Goldie. She’s a buff orpington, the same breed as Daisy. She is a mature adult but I have no way to tell how old she is. She was dirty and tired and very scared. She was obviously not used to humans trying to be kind to her so we kept our distance and let her settle down. A chicken on the run has no time for preening and usually gets fitful sleep so she really was a mess. She instinctually jumped up on her perch and fell asleep at dark. The next morning she awoke with the sun and started making those wonderful clucky sounds. Soon thereafter she settled in her makeshift nest and sat there for the next FIVE HOURS! Do you, mind? I’m trying to lay an egg here. It usually takes a healthy chicken about 30 minutes to an hour to lay her egg, but I suspect this girl had not had an opportunity to lay one for days so she had a lot of work to do in order to complete the job. 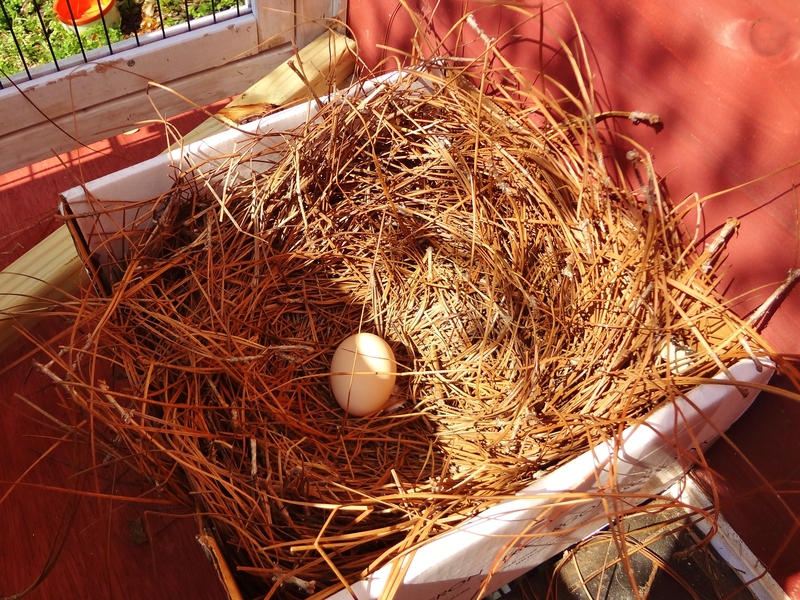 Sure enough, after a very long time, I looked in the nest to find a little present. Of course Amy got the first egg since she was responsible for this whole thing. How was it Amy? Did you scramble or fry? 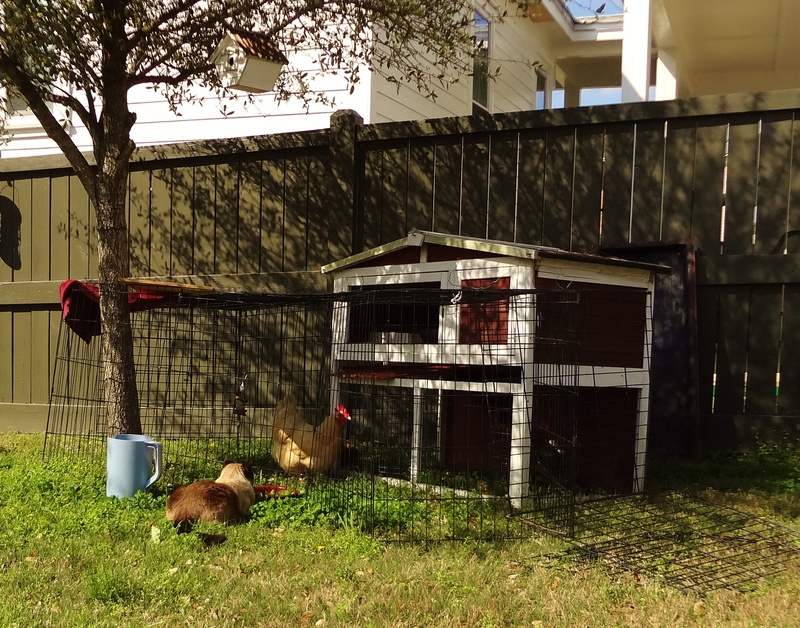 Now the coop and the cobbled-together chicken fencing was terrible looking. We had to fix something up quick and the best we could do was not a pretty picture. Mulder thinks it looks OK. Immediately I started begging, whining, asking Jim to let me buy one of those cute catalog coops that look like little farm houses or barns. He put his size 8 1/2 down and told me that those coops are crap and he wasn’t about to buy one for a chicken we may not be able to keep anyway. Besides, he said, “If we are keeping her I can build her a coop.” Nooooooooooooooooooooooooooo! I have no doubt that my husband can make a fabulous coop (he’s done it before) but his time is very limited and it takes him a very long time for a construction project of that kind. I feel certain that given time and diligence, I can persuade him to buy a well-made, aesthetically pleasing coop, but not anytime soon. So I had to make due with the messy contraption in our back yard. 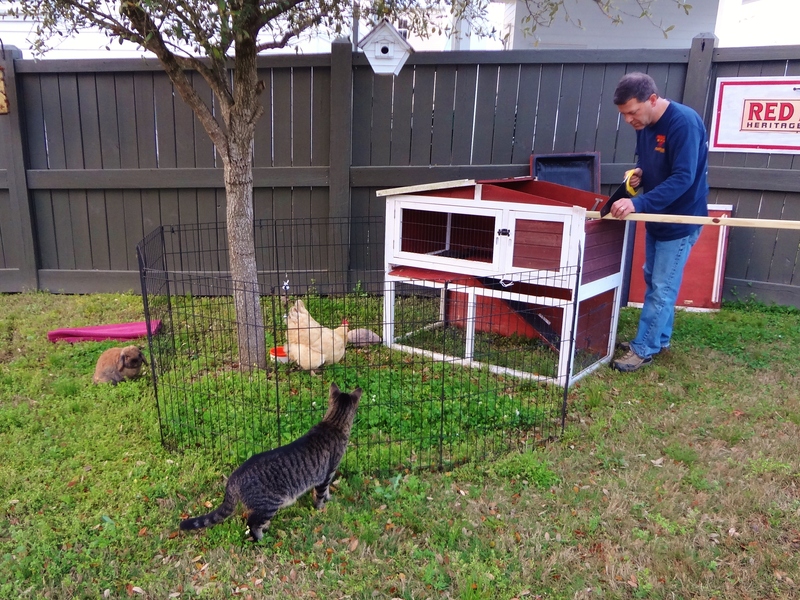 I went to work with some pliers and took apart the pet enclosure that my pal loaned me, (Thanks Susna) and I made a chicken run with sections of doggy fence and metal twist ties. It won’t make the cover of Southern Living, but I think it looks pretty nice. Looks like you certainly have a spring chicken 🙂 Now if you really want to make her happy, give her some raw ground beef or ground deer. Mine think it’s dessert.